BELLIN - Carte du Katay ou Empire de Kin. . .
BELLIN, J.N. - Carte du Katay ou Empire de Kin. . .
Carte du Katay ou Empire de Kin. . . - BELLIN, J.N. 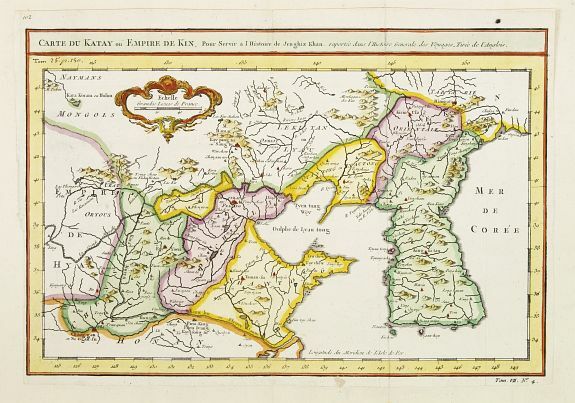 Title : Carte du Katay ou Empire de Kin. . .. Size : 8.1 x 12.2 inches. / 20.6 x 31.0 cm. Description :The map is of interest for the use of Mer de Corée, for the sea between Korea and Japan .Fine map of Korea and China's Yellow Sea. Complete title in top: Carte du Katay ou Empire de Kin, pour servir de l'Histoire de Jenghiz Khan. Raportée dans histoire Générale des Voyages Tirée de l'Anglois.. Condition : Good impression. Map cut till neat line, and contemporarily laid down on a larger sheet of paper to fit in a larger atlas.